Apartment House Zizkov i Prag, Tjekkiet: Reservér nu! 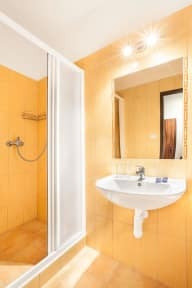 This beautiful accommodation is located in the center of Prague in a quiet, central location. You will get free WiFi access and TV. Luggage storage as well as parking facilities are available here. Apartment House Zizkov has an ideal location in a quiet, residential neighborhood Žižkov with an unforgettable atmosphere. Wenceslas Square and the shopping street Na Příkopech are only a few minutes away by public transport. It is the same with other major sights in Prague. Apartment House Zizkov offers 14 rooms including five suites, which are furnished with comfortable modern furniture. There is a bathroom with accessories in every room. The suites also have a living room and a kitchen.